Preheat oven to 350 degrees. Grease and flour a 9- or 10-inch baking stoneware dish or spray with vegetable spray and sprinkle with unseasoned bread crumbs. In a medium bowl, mix together flour, cornmeal, baking soda, spices and salt; set aside. In a large mixing bowl, beat together butter and sugar until blended. Beat in pumpkin, eggs and water and mix just until blended. Stir in flour mixture. Fold in nuts and raisins. Pour into prepared stoneware and bake 55 to 65 minutes or until a wooden skewer inserted into the center of the bread comes out dry. Cool in stoneware for 10 minutes. Cool completely on a rack. Gave myself a treat listening to your show today Wednesday 11-19-14 while driving home from my daily chores on the Northfolk of LI, NY and was inspired by your lively and spirited to dust off my baking tins and pull out my wine glasses and enjoy my efforts and your guests suggestions and research. 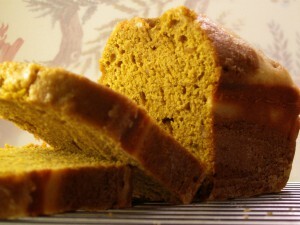 Looking forward to surprising my husband with your Pumpkin Bread , sounds delicious , can’t wait to try it. Thank you for your guests , show and a remarkable sense of humor. I was confused by what type of pan this large amount of batter should be baked in. The recipe calls for a 9-10 inch baking stoneware “dish,” but as it is called Pumpkin Bread, I opted for a ceramic loaf pan. Right now it has 20 minutes left to bake and chunks of semi-baked bread are breaking off of the risen surface and falling on the oven floor. I don’t have high hopes for it turning out well, but please clarify what kind of dish/pan to bake it in in case I want to try again. A cake pan? Pie pan? Hi Gail. We checked in with Linda for clarification. Here’s what she said: “I’ve always used a 9-inch stoneware Pfaltzgraff dish to get a nice round loaf. The dish is slightly deeper than a regular pie plate, about 1-1/2 inches deep.” Here’s another tip from Linda. If you go the loaf pan route, use TWO 9-inch loaf pans. The bread should take about the same amount of time to bake. I hope this helps the next loaf (or loaves!) come out perfect.